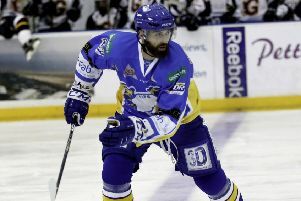 A claim of biting has been made in Sunday’s flashpoint in Fife Flyers’ game against Manchester Storm. The English club says it has have lodged photographic evidence of injuries sustained by tough winger Devin Didiomete who is already under investigation for a check to the head and then trying to climb the plexi-glass to attack Fife Flyers’ Danny Stewart who was sitting in the sin bin. The incident is under review by the Elite League’s Department of Player Safety (DOPS). It will deliver its decision on Wednesday. The original flashpoint came early in the game as Didiomete had a dig at Stewart and drove him into the plexi after the puck was frozen near the home goal. After a wrestle on the ice pad - which saw other players also tangle - Stewart was sin binned, while Didiomete was thrown out of the game for checking to the head; a penalty which is automatically reviewed by DOPS. As he left the ice he gestured to the Fife fans, and then, instead of going to the dressing-room, he went along the walkway behind the sin bin to confrnt Stewart who is seen on video banging the glass, prompting Didiomete to climb up and throw a punch before being escorted into the locker room. Storm have asked for a review on Stewart, suggesting the Storm player was bitten - although a statement posted on the club’s official website today doesn’t name Fife’s assistant coach directly.